Two days since Felipe Massa was hit on the head by a 1.5-pound chunk-of-suspension at 150 MPH during qualifying for Sunday's Hungarian Grand Prix and smashing his face into hamburger (above), he's awake and stable. Here's what we know. 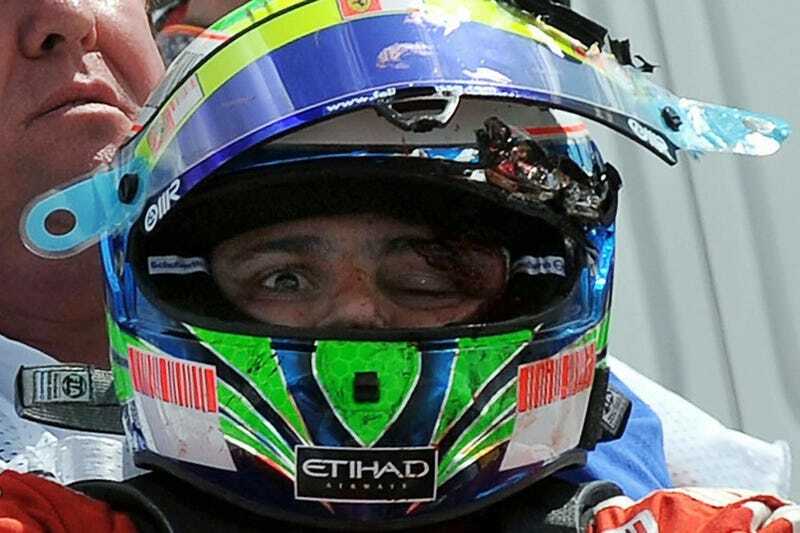 Felipe Massa In Intensive Care After Brutal Hungarian GP Crash! A quick recap on what's happened so far: Felipe Massa was four seconds behind Rubens Barrichello’s Brawn in his Ferrari when a spring came off his fellow Brazilian’s suspension and hit Massa in the head above his left eye. He lost consciousness, slammed into a tire wall and was immediately airlifted to hospital where he was operated on. After being in sedation for two days, he is now awake with family, moving his extremities and is described by doctors as being in stable condition. The fine people of ÁEK—the Állami Egészségügyi Központ (“State Medical Center”), Hungary’s top medical institution—have taken great care of the young Brazilian. He has suffered some damage to the eye. We don’t know if he’ll be able to race again. It’s too early to say about his future. Ferrari’s president Luca di Montezemolo is currently at his bedside. We’ll let you know more as details crop up but it appears that we can rest assured that he has survived the most critical phase of his accident. Note: videos from Formula One have a way of disappearing rapidly from the internet due to vigorous legal action. Massa's accident is already gone from YouTube. We've embedded this copy from Indavideó, a Hungarian video sharing site, which may also have to remove it at some future point, so watch it while you can.